The car Derek Fisher was driving before he was arrested on suspicion of DUI last weekend was registered to former teammate Matt Barnes, according to a report from TMZ. Fisher was driving on a Los Angeles freeway with his current girlfriend—and Barnes’s former wife—Gloria Govan at 3 a.m. on Sunday morning when he drifted off the road and flipped the 2015 Cadillac Escalade onto its roof. Though the car was totaled, neither he nor Govan were injured, and he was arrested for driving under the influence. Now, TMZ reports that the Escalade is registered to Barnes. He reportedly gifted it to Govan specifically for the purpose of driving around the pair’s two children. They broke up in 2014—clearing the way for Govan and Fisher to begin dating and for Barnes to drive nearly 100 miles for the sole purpose of fighting Fisher for doing so in October 2015—but their divorce was not final until December 2016. Barnes is currently in the NBA Finals with the Golden State Warriors. Fisher has not been in the NBA since being fired as head coach of the New York Knicks in February 2016. 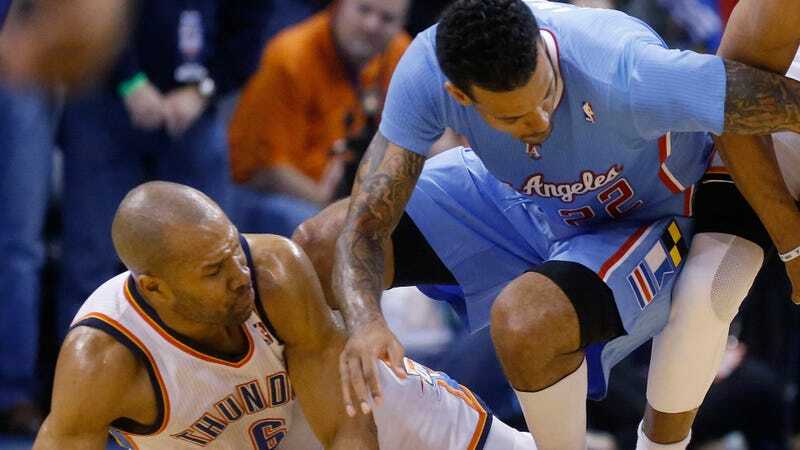 Derek Fisher Arrested On Suspicion Of DUI After Reportedly Flipping Car At 3 A.M.